There are hundreds of reasons why you may need to remove the prices from your pages: some products are out of stock at the moment or you don’t want to show prices in some cases…then our Call for Price extension will help you hide product price. So customers want to know product price, they should send request to shop owner by message. Call for Price extension easily replaces “Add to Cart” button by “Call for Price”. It allows web manager to leave a message to clients and suggest them making a request for price. When customers want to know price of products and buy them, they will click “Call for Price” button, the extension will show message in a popup form on website. Customers fulfill personal information in available form and submit. 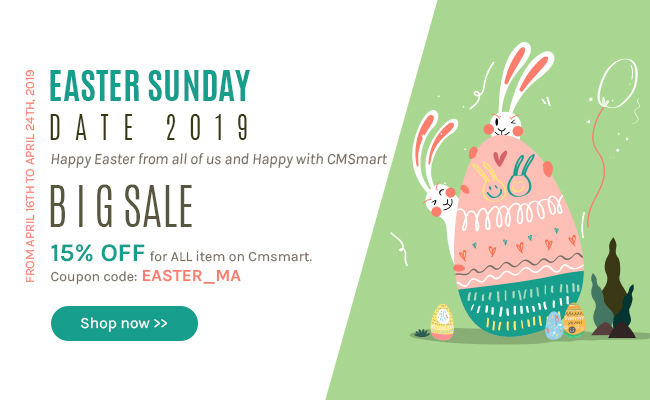 This extension will be responsible for sending email directly to website manager and mail feedback to customer with template that can be created in backend. Especially, you can enable Call for price for some fields of user and stores are Customer Group, Customer ID & Multi-store. Step 1: Go to the category page, and then choose a product you like. Step 2: Click on “Call for Price" button. A pop-up will be shown. Step 3: Fill full mandatory information (First name, last name, email, phone, address, and message) then click on "Send mail" button. Step 3: Go to Catalog → Manage Products to activate Call for Price Extension. Message popup form: With the message in popup form, customers want to know product information; they should click on "Call for Price" button that will show a popup form. 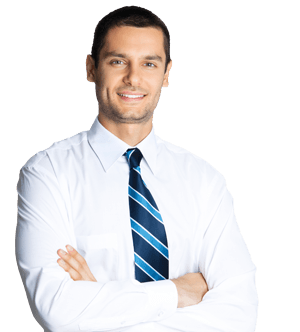 It allows them to fill all personal information into all marked requirements. Then they will write message and press "Send email" to send to shop owners. Set up call for price option: Admin will go to backend system to configure and select "yes" to enable the extension and can also change the text link and set up admin email. Encourage customers to call for pricing. Same conditions as in catalog price rules. Main product types support; simple and configurable. I have reviewed several similar extensions and have found this one is the best! I got all the described features working out of the box. I purchased this module as after doing some research, it satisfied my requirement about the theme with User-friendly and feature-rich module. the modules in this package works really well. no bug detected so far. I run a online fashion boutique and I decided to buy and use your extension. The achievement I achieve is even better than what i have ever expected. Highly recommended! After using your extension, my customers are all satisfied and so do I. Good quality and reasonable price! Thank you and be lucky with your sales! creative work. Good luck with sales! Extension is very interesting, I have used it and I am satisfied not only your product quality but also your customer services. Recommend 5 star for CMSmart. 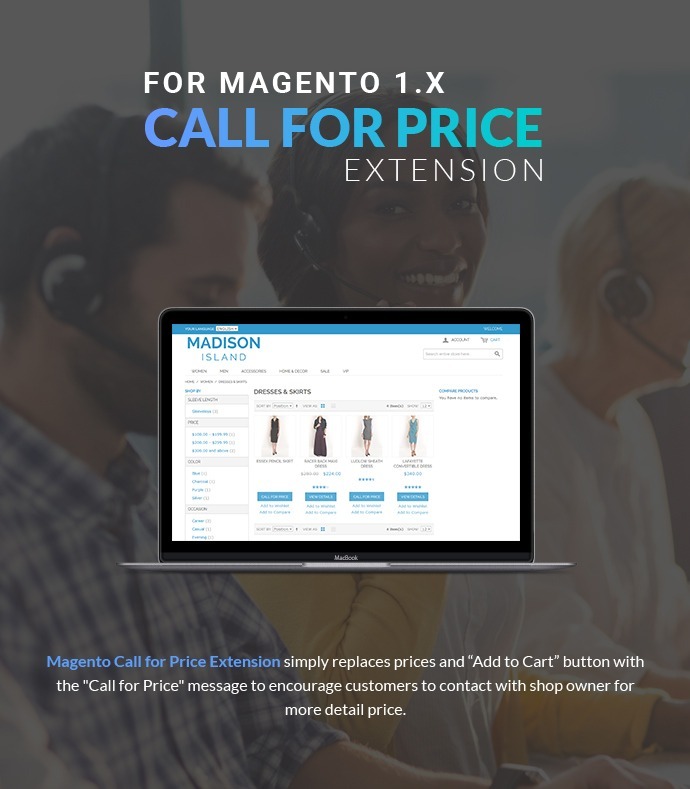 Can I adjust Magento call for Price to fit our website (button size, color, language)? In the current version, our template doesn’t support this features but if you really want to get this features, we can consider customizing for you. And we will try our best to update it in the next version. Can I enable/disable Call for Price button on some products? Yes, you do that. It’s available in our product. Can I replace Add to cart button by Call for Price? Yes, you can replace Add to cart button by Call for Price. + Step 1: Go to the back-end of your website. How to enable “Call For Price” extension for specific customer groups? + Step 4: Choose Product you want. + Step 5: Click on “Call for Price” tab in column right. + Step 6: You can see “Allowed Customer Group”, please select Customer Group you want. + Step 7: Save and F5 your page. How can I setup Receiving Message with my info in the back-end? In the current version, our product doesn't support this features. I would like to know if your extension is 100% open source? we will need to adjust it to fit our website (button size, color, language), and also we will need to adjust the contact form (for example: less fields to field and different design). Our extension is 100% open source so don't worry about that. About the 2nd request, our extension supports this function so don't worry about that. You can do it by yourself or list all the things that you want to change so my dev team can do it for you as a customization service. What happened to your demo video? We fixed the demo so please check it once again. I tried your demo again and it seems there are few bugs. We will try to fix it that problem right now. Hi! Does this Extension works for the List and Category View too? Because in your demo, it works only on the frontpage!! Yes, our product can work for the list and category. Do you have any question about our product? If yes, please let me know. + Fix error conflict with theme.